We offer a range of classic, all-weather and 3-fingered gloves by Gompy, Bear Paw and Neet. Black leather. Leather tipped for a smooth release. Elastic backed and Velcro fastening for a comfortable fit. An alternative to a tab. Suede with leather finger pads. Adjustable wrist strap with a popper fastening. 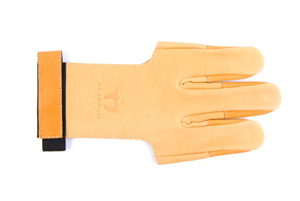 A tan suede glove with leather finger pads. Elasticated back and Velcro wrist for quick removal. 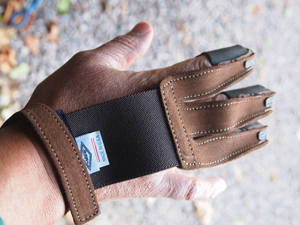 This shooting glove is made of an extremely soft and premium Bearpaw leather. Due to its extra strong and thick leather the Classic shooting glove provides superb protection for your fingers and gives you the feeling of an great comfort without reducing the feeling of the string and release. We were smitten with these mittens as soon as we saw them. 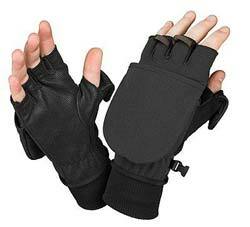 Made by Sealskinz®, these warm, convertible gloves/mittens with thumb and finger pockets are ideal winter shooting. 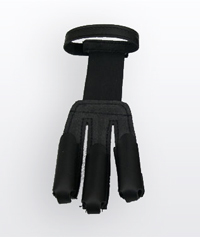 The easy fold-over thumb and finger pockets are kept out of the way by small magnets concealed in the gloves, allowing tabs to be used during shooting unhindered. 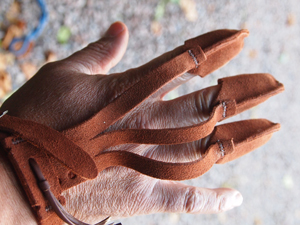 The fold-overs are quick to replace to keep fingers warm whilst collect arrows. Loops on the fingers make removing the gloves very easy. A great addition to an archer’s outdoor clothing. These gloves are engineered with Sealskinz®, UNIQUE waterproof membrane but are NOT waterproof around the removable fingers.